Garibaldi manufactures garments, gloves and accessories for motorbikers since 1972, when it developed the first Spanish wax cotton jacket. From its beginnings it is also the exclusive distributor in Spain for the Italian helmet manufacturer Nolan Group. Let´s find out more though. Garibaldi starts its own business into the spare-part car market under the brand name of Pedro Guillamet, importing Italian products of the most representative brands. 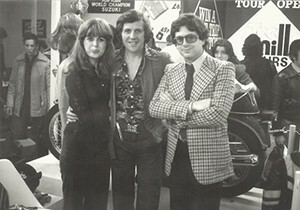 At the end of 1972 Garibaldi´s founders, Josep Maria and Isabel, drift their main product business to enter the motorbike market, which had big potential and establish the company Guillamet Garibaldi. In their early times they mainly produced rider leather suits and greasing garments and imported helmets of several italian brands such as NOLAN. In 1975 the company changes its name to GARIBALDI and launches the Internazionale jacket which represents its first great hit. Throughout those years, the company starts a close collaboration with Nolan Group as an only distributor for Spain and later on becomes partner of the Italian company. At the end of the 70´s it launches another classic greased jacket called Original which represents the second greatest hit. 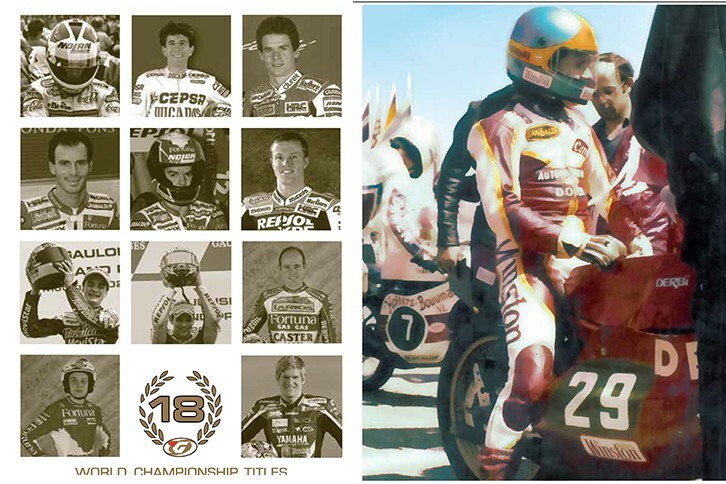 In the 80’s Garibaldi puts its efforts on the handmade competition leather suits and signs up the best riders of the moment such as Ricardo Tormo, Sito Pons, Aspar, Alex Crivillé, Alex Barros, Carlos Checa, Sete Gibernau, Toni Elias, Dani Pedrosa, Jordi Tarrés, Marc Colomer, Carlos Mas and David Checa among others. Mostly all of them became World Champions with Garibaldi :18 World Champion titles are the final result of this successful period. At the moment a cohesive team manages the company enhanced by the collaboration of several faithful freelancers. Georgina, Isabel and Josep Maria´s daughter, took over the lead of the company in 2010. Since then achieving excellence in all aspects of their work has been their goal to foster a hi quality culture. As a result, a new urban concept has been introduced with a classic and vintage touch, which reminds us of the 70´s. Last but not least, Garibaldi makes its garments with the best materials and fabrics and its suppliers have been chosen from the best specialists of each field to guarantee an utmost quality. In the 80’s Garibaldi puts its efforts on the handmade competition leather suits and signs up the best riders of the moment like Ricardo Tormo, Sito Pons, Aspar, Alex Crivillé, Alex Barros, Carlos Checa, Sete Gibernau, Toni Elias, Dani Pedrosa, Jordi Tarrés, Marc Colomer, Carlos Mas and David Checa among others. Mostly all of them became World Champions with Garibaldi :18 World Champion titles are the final result of this successful period.